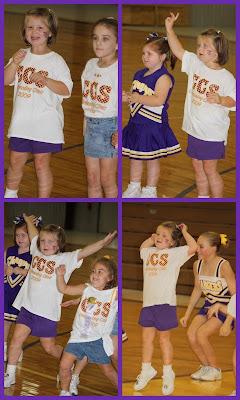 shelly's summary: My Little Charger Cheerleader!!! 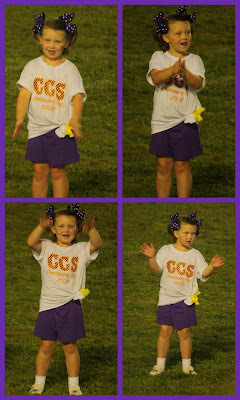 She also got to cheer as part of the half time show at the football game friday night. I was worried how she would do b.c it was raining and she HATES to get wet... but she went out there and cheered and danced just fine... i did not get too many pictures since it was raining i was more concerned about being under the umbrella and keeping my camera dry. most of these varisty cheerleaders i taught a few years back... they were so sweet to brylee... and gave her lots of extra attention which of course she LOVED... she thinks the girls are the greatest! I guess this little clinic has confirmed that we will be cheering for the youth league next year... i can't wait and neither can she!